SizeMeNow allows you to customize what items are being scanned. You can either scan all items except some excluded ones, or explicitly specify which items are allowed to be scanned. This is done using regular expressions and the Include/Exclude dialog below. See Regular Expression Rules for details on how to write regular expressions for SizeMeNow. Include Files Radio Button: If selected, only the files and folders which match regular expressions below will be scanned in any given scan. All others will be ignored as if they do not exist. 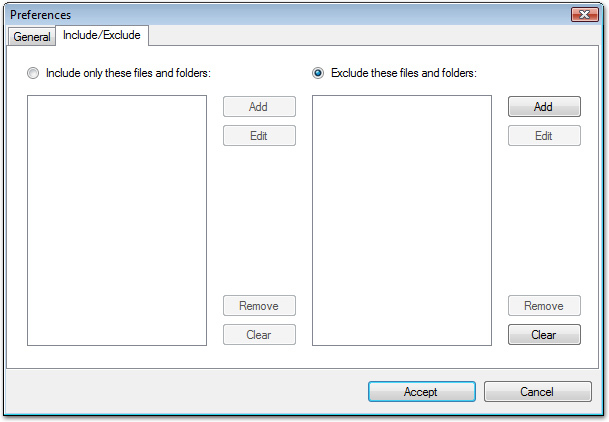 Exclude Files Radio Button: If selected, the files and folders which match regular expressions below will be ignored as if they do not exist. All other files and folders encountered will be processed as usual. Add: Adds a regular expression to the corresponding list. Edit: Edits the currently selected regular expression in the corresponding list. Remove: Removes the selected regular expression from the corresponding list. Clear: Removes all expressions from the corresponding list.